Siriki Dembele made an in instant impression on his Posh debut at Stamford AFC. Photo: Joe Dent/theposh.com. It took Siriki Dembele five minutes to introduce himself in the best possible way to Peterborough United fans. The wing wizard with a big box of tricks had already delivered one high class run down the left wing before he took careful aim from 25 yards and planted a firm right foot shot into the corner of Stamford AFC’s net. New Posh striker Matt Godden in action at Stamford AFC. Joe Dent/theposh.com. It turned out to be the best moment of the first-half at the Zeeco Stadium which is often the way in these pre-season friendlies. A strong-looking Posh side had little trouble dominating the ball, but found adding goals much more difficult. Matt Godden spurned two early chances, while busy Danny Lloyd stayed onside long enough to fizz a shot that needed tipping over the bar by Stamford ‘keeper Danny Haystead. Early impressions of this much-altered side included sheer wonderment at the size of the back four (they are huge) and neat and tidy touches from midfielders Mark O’Hara and Alex Woodyard. Stamford competed, but rarely threatened. Liam Adams came closest to troubling Conor O’Malley in the Posh goal, but his 25 yard strike curled wide. Summer signing Mark O'Hara in action for Posh at Stamford AFC. Joe Dent/theposh.com. 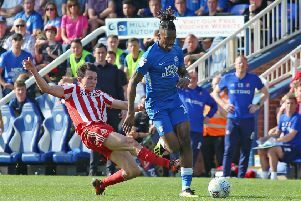 Posh changed all 11 players for the second half and gave run-outs to two trialists, one of whom was former Brighton midfielder Anton Rodgers, son of Celtic manager Brendan Rodgers. The changes almost backfired as Adams immediately missed a good chance at the far post following a right wing cross. Stamford certainly saw more of the ball after the break, but it was Posh who claimed the second goal just before the hour mark when Mathew Stevens intercepted a weak clearance kick from Haystead before rolling the ball into the back of the net. The home side should have replied minutes later, but large Posh ‘keeper Aaron Chapman was quickly off his line to block Adams after the striker had raced clear. Stamford pulled a goal back from the spot 16 minutes from time, Adams scoring after he’d been fouled by the other trialist. But that merely sparked Posh into late action. Three goals in a five minute spell delivered a flattering final scoreline. George Cooper netted with a superb chip before setting up Stevens for his second. New summer signing Louis Reed set up a fifth goal for Joe Ward which was harsh on the hosts. POSH (first half): Conor O’Malley, Jason Naismith, Colin Daniel, Ryan Tafazolli, Rhys Bennett, Alex Woodyard, Mark O’Hara, Gwion Edwards, Siriki Dembele, Danny Lloyd, Matt Godden. POSH: (second half): Aaron Chapman, A. Triallist, Lewis Freestone, Jack Baldwin, Sam Cartwright, Adam King, Louis Reed, George Cooper, Mathew Stevens, Joe Ward, A. Triallist. STAMFORD: Danny Haystead, Joe Burgess, Josh Eggington, Taron Hare, Callum Ball, Jordan Smith, Jake Duffy, Bradley Fortnam-Tomlinson, Liam Adams, Reece Morris. Subs: Jon Challinor, Elliot Putman, Rob Morgan, Joe Lindley, Stanley Mugisha, Tristan Kilby, Hugo Ellwood. Goals: Posh - Dembele (5 mins), Stevens (59 mins & 84 mins), Cooper (82 mins), Ward (86 mins). Stamford - Adams (pen, 74 mins).